President David Conrad opened the meeting at 6:33 PM. Paul Wood led members in the Pledge of Allegiance. D.C. BOARD OF ETHICS AND ACCOUNTABILITY. Attorney Advisor Ashley Cooks of the D.C. Board of Ethics and Accountability (BEGA) spoke at length about the responsibilities of the organization. She was later joined by Attorney Brian Flowers, who also answered questions, and Traci L. Hughes, Director of Office of Open Government. Ms. Hughes spoke and answered questions separately. BEGA comprises five members selected by the Mayor and approved by the Council who serve for a six year term. BEGA includes the Office of Open Government and the Office of Government Ethics. They are comprised of two main efforts – the Office of Open Government and Office of Government Ethics. The Office of Government Ethics has jurisdiction over all 33,000 District Government employees but is restricted to a five year statue of limitations. It may impose up to $5,000 per violation. Violations are adjudicated in an open adversarial meeting, Many violations result in a negotiated result. The only D.C. ethics law which applies to Advisory Neighborhood Commissioners (ANCs) relates to conflicts of interest. BEGA is also responsible for Financial Disclosure Filings and Lobbyist Registration and Activity Reports. BEGA published an Ethics Manual and an Annual Best Practices Report. Ms. Hughes described a recent example of the work of the Office of Open Government. It forced the release of audio recordings of a December 13, 2017 closed-door meeting of the United Medical Center’s board to shut down its obstetrics unit. The D.C. Office for Open Government ruled that the closed-door meeting was a violation of the Open Meetings Act and forced the board to make its recording public. TREASURER’S REPORT. Ms. Beulah Sutherland read the treasurer’s report. D.C. COMPREHENSIVE PLAN. The Comprehensive Plan is published by the Office of Zoning and the Zoning Commission. It guides decisions on zoning proposals. Ms. Elizabeth McGowan, MPCA Delegate to the D.C. Federation of Citizens Association, described recent efforts of the Federation to address the proposed changes in the comprehensive plan. Ms. McGowan provided both a link to the draft plan and documents relating Federation concerns to the MPCA Secretary for posting on the MPCA website, www.michgianparkdc.org. She also noted an opportunity for residents to testify in person or in writing at an at-large forum on April 11, 2018. Neighbors raised various concerns related to development. The proposed comprehensive plan eliminates the current requirement for the city to place “great emphasis” on input from ANCs. The city relies on traffic studies commissioned by developers for development decisions. The Citizens Federation is holding an At-Large Candidates and Chairman’s Forum on Saturday, April 14, 2018 in the Masonic Temple Ballroom, 1000 U Street NW. Doors will open at 10:00 am with the forum starting at 11:00 am. The building is located next to a metro. This is a totally member driven event. Panelist will be chosen from member organizations and we want them to ask the questions that are important to you and your communities. Please send your questions to president@dccitizensfederation.org and spread the word in your associations and communities that your questions are welcomed. The meeting ended just after 8 PM. Please see the following link to the Comprehensive Plan Framework Element (Draft), which you may cut and past into your browser. Two additional documents are attached outlines various concerns. President David Conrad opened the meeting at 6:38 PM. Paul Wood led members in the Pledge of Allegiance. PROVIDENCE HOSPITAL Ms. Ruth Pollard, Vice President & Chief Strategy Officer, Providence Hospital, spoke about recent and planned changes at Providence Hospital, the longest operating hospital in D.C. Over the last two years Providence Hospital had major financial losses of more than 30 million dollars. 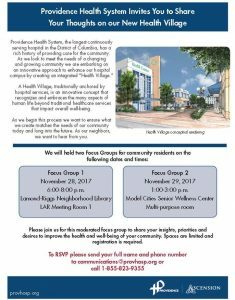 Recently, Providence closed its maternity ward and its extended stay residential mental health services. Both of these services were major sources of loss as they required 24/7 services of specialists and staff for a relatively small number of patients. For example, the hospital had a small 5 bed neonatal unit that required the same staffing requirements as Children’s Hospital. Therefore, it made no sense for Providence to maintain its small unit when one of the country’s best children’s hospital was just a mile away. Providence Hospital will refocus its services to being a wellness center with doctors and offices located at Providence who will send their patients for tests using the hospital’s equipment. The hospital also hope to provide outpatient clinics that will help their doctor’s patients make the changes that will improve their health. The hospital will have in/out surgeries and will have beds available for those patients needing overnight monitoring. However, the hospital will no longer have an emergency room but will become an acute care center seeing patients with non life-threatening emergencies. As with the patients having in/out surgeries, the hospital will have beds for these patients who may need additional monitoring after coming in as acute care patients. Patients coming to the hospital needing emergency room services will be stabilized and sent to another hospital for appropriate care. TREASURER’S REPORT. Treasurer Beulah Sutherland read the treasurer’s report. Membership fees of $10 is for the calendar year. TRAFFIC. Much discussion focused on the newly renovated intersection at 10th and Michigan Avenue. The mixture of buses, commuter vans, illegal turns and pedestrians is dangerous. Mr. Ralph Bucksell noted that some photos of the situation may elicit attention from DDOT to this problem intersection. Kelley Cislo, Constituent Services for Council Member McDuffie can assist. President Conrad envisions more collaboration with the D.C. Federation of Civic Associations (Michigan Park Citizens Association is a member of the D.C. Federation of Citizens Association). Ms. Marita Riddick, representative to Council Member Kenyan R. McDuffie, discussed neighborhood issues and answer questions. Much discussion was focused on the need to attend public meetings despite demands on one’s time during the work day. Mr. Lionel Gaines, representative to Mayor Muriel Bowser passed out literature and answered neighbor’s questions about the Mayor’s efforts to reduce homelessness. Residents noted that they would like to see more of the Mayor’s accomplishments to reduce homelessness reflected in the distributed literature. Reducing homelessness is a major priority of the current city’s administration, and more details would be welcome. The meeting ended at 08:10 PM. President David Conrad opened the meeting at 7:42 PM with the pledge of allegiance. Mr. Don Looney provided updates from the Federation of Citizens Association. The Federation will host a special meeting on November 15, 2017 to address the proposed comprehensive plan. Several knowledgeable citizen activists will speak. Mr. Scott Einberger, Park Service employee and author of A History of Rock Creek Park: Wilderness and Washington D.C., 2014. spoke about the Fort Bunker Hill park and the circle parks in the district. 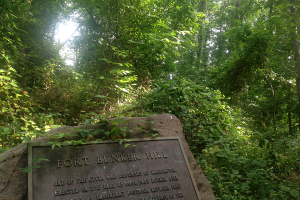 Mr. Einberger’s description of the Bunker Hill recalled to the minds of many residents the activities once held there. Catholic University’s theater group held plays in the park during the summer, and the top of the park was a favored picnic area. Mr. Ralph Bucksell spoke about the growing concerns of the damage to homes from heavy truck traffic. He noted that the 12th Street neighbors between Michigan Avenue and Shepherd hired a structural engineer to assess the impact of truck traffic on their homes. The engineer determined that trucks in excess of 1 1/4 tons are causing structural damage to the homes as they pass along 12th Street. 12th Street is not constructed for heavy vehicular traffic. Michigan Avenue and South Dakota are class A roads. South Dakota and Gallatin Streets are class B road. South Dakota, specifically, has a few feet of poured concrete which allows heavy trucks to pass over without causing damage to nearby structure. Planned construction in the neighborhood will necessarily require heavy truck traffic along 12th and 13th Streets, among others, and may damage current structures at the expense of building new structures. Ms Marita Riddick made several announcements on behalf of Councilmember McDuffie. Mr. McDuffie’s staff releases a monthly one sheet leaflet with calendar events in 5th District. President Conrad led members in a review the MPCA’s handling of the proposed EYA development of the Saint Joseph’s Property. Several strengths and failures of the Association’s efforts were raised. On the plus side, MPCA gained a voice in the Comprehensive Plan and proposals for zoning. Out west, public lands come in massive size. The large state of Nevada, for instance, is mostly public land managed by the Bureau of Land Management and U.S. Forest Service. In Michigan Park, public lands come in much smaller size. Nevertheless, they have significant stories. The neighborhood’s public lands include the square, city block-sized Fort Bunker Hill Park as well as the narrow green strip between Eastern Avenue NE and the Maryland boundary. What is now known as Fort Bunker Hill Park was once an earthen fortress, built in the early years of the Civil War in order to defend Washington, DC from a Confederate attack. While the small, hilltop fort never saw action, it is safe to assume that many of its troops hotfooted it a couple of miles north to assist fellow soldiers during the Battle of Fort Stevens in July of 1864. Indeed, “Johnny Rebel” entered the District of Columbia, skirmishing and causing casualties during the Battle of Fort Stevens. After the war though, the majority of DC’s dozens of Civil War defenses were decommissioned, their materials going up for public auction, the land going fallow in most cases. Figure One: Civil War Defenses of Washington, circa 1863. While many of the forts have been lost over the years, Fort Bunker Hill remains as a small park. Civil War Trust Photo. Before, during, and directly after the Civil War, there was an increase in urban pollution nationwide. To combat this, certain landscape architects and public officials began calling for and designing parks. These parks were away from the city yet in the city. New York City’s Central Park was established in the 1850s and DC’s very own Rock Creek Park was established in 1890. 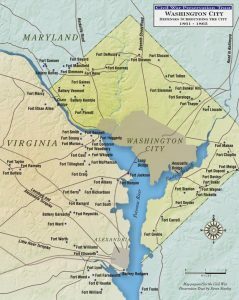 In this same decade, in the beginning of what became known as the City Beautiful movement, some District leaders began calling for a scenic fort-to-fort drive that would link the national capital’s ring of forts together from the Palisades neighborhood clear over to the Anacostia River’s terminus into the Potomac. As such, over the next several decades, as much as appropriations allowed, Uncle Sam began buying back the fort properties as well as narrow corridors in between them. Figure Two: Fort Bunker Hill Park amphitheater, circa 1960. 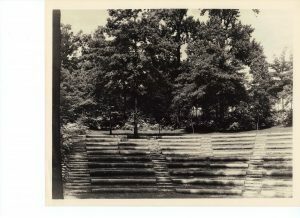 The 250-seat amphitheater was a popular spot for ranger-naturalist programs and drama performances put on by Catholic University. National Park Service Photo. While the park was thriving, the Fort Circle Drive plan ultimately faltered. Over-eagerly perhaps, the Washington Post wrote in 1937 that only one more mile was needed and the city would have a drive linking the forts that would be “one of the nation’s most scenic and historic.”[iv] But essentially only a couple miles of the road were ever built. Perhaps part of the Fort Circle Drive failure was due to the larger capital beltway construction. To this day, the green spaces that were initially purchased for the Fort Circle Drive remain partially forested and partially grass fields that seem to go largely unutilized. Should playgrounds be interspersed in these public spaces to invite more recreation? Should hundreds of additional trees be planted to create an open forest in order to beautify the areas and remove carbon dioxide from the atmosphere? Should a trail of sorts be constructed? Should the landscape be left as is? I’ve heard friends and bloggers propose some of these ideas. Regarding Bunker Hill Park, the amphitheater and programming days are long gone. According to one local resident, the day the drama department pulled out of the park in the late 1970s, the park began a “long, slow process of deterioration.”[vi] With National Park Service staffing levels and appropriations decreasing, the decline perhaps continues to this day. Indeed, while mature trees now stand sentinel over the square park, invasive plant groundcover rules supreme in the understory, especially English ivy. Two dilapidating streetlights, water fountain remains, an earthen stage and a couple of stone steps leading up to it are remnants of Fort Bunker Hill Park’s heyday. Figure Three: Civil War memorial stone in the park with both native and invasive plants behind. Such is the nature of the park today. Brookland Neighborhood Civic Association Photo. Scott Einberger is an environmental historian, author, and former U.S. National Park Service interpretive park ranger. Learn more at www.publiclandslover.weebly.com. [i] Lisa Pfueller Davidson and James A. Jacobs, Civilian Conservation Corps Activities in the National Capital Region of the National Park Service Historic American Buildings Survey (HABS DC-858) (Washington, DC: National Park Service, n.d.), 39, 41, 96-97; Brent McKee, “Fort Bunker Hill Park: Washington, DC,” Living New Deal, May 24, 2013, www.livingnewdeal.org. [ii] National Park Service, Rapid Ethnographic Assessment of Park Users and Neighbors, Civil War Defenses of Washington (Washington, DC: Juarez and Associates, Inc., 1997), Rock Creek Park Interpretive Resource Files, 153. [iii] Interview with Author, November 7, 2017. [iv] October 10, 1937. Washington Post Online Archives. [v] See “The Fort Park System,” Chapter 3, in National Park Service, A Historic Resource Study: The Civil War Defenses of Washington, Part II;“Big Idea Intro and Fort Circle Parks,” CapitalSpace, http://docs.google.com/a/nps.gov. [vii] See photos at “SCA DC & Baltimore” Facebook page. Our sister neighborhood organization, Queens Chapel Civic Association, has invited neighbors to an educational forum on DC Statehood, Monday, November 20, 2017, UDC Community College, 5171 South Dakota Avenue NE, 6:30 to 8:30 pm. See attached flyer. President David Conrad opened the meeting and Mr. Paul Wood led the attendees in the pledge of the allegiance. No change was made to the treasurer’s report since last month. CIRCLE PARKS. Mr. Scott Einberger, author of A History of Rock Creek Park: Wilderness and Washington, DC (2014), visit was postponed to November. Mr. Einberger has offered to speak about the history of the circle park of which Bunker Hill and Fort Totten are two. WASHINGTON POST. Washington Post reported Audrey E. Hoffer interviewed President Conrad and ANC Representative John Feeley about the neighborhood for planned article. FEDERATION NEWS. Ms. Elizabeth McGowan, MPCA representative to the D.C. Federation of Citizens Association, spoke of items of interest from the Federation’s September meeting. The Federation’s annual Christmas luncheon will be held at the Dacor Bacon House. An event leaflet is soon expected. River Terrace brought to the attention of the Federation their lack of access to public facilities due to the city’s requirement for civic organizations to pay for their own security while using public buildings. This problem caused our own association to move meetings from Bunker Hill Elementary to first Providence Hospital and now Turkey Thicket Recreational Center. As a result of River Terrace and the Federation’s advocacy, the Amendment Act of the Budget Support Act of 2017 would permanently drop this requirement for established neighborhood associations. This news is well received as the Michigan Park Citizens Association not only met at the Bunker Hill, 1400 Michigan Avenue NE, since the school opened around 1940, but also had strongly advocated for its construction. BUNKER HILL. Also regarding Bunker Hill Elementary School, the association received a letter of thank and certificate from Principal Kara Kuchemba for the continued support of the students and school sponsored events. HOWARD UNIVERSITY. President Conrad, recently in contact with Howard University, spoke about the planned development of the divinity school and property. The Urban Land Institute had conducted a study last year proposed a modest plan with new construction buffered from the neighborhood and a senior residence. However, there are as yet no specific plans. Howard has issued a request for proposals from developers and will select a master developer. BAZZUTO. Mr. Bobby Bird, who has been the developer’s representative to the association, informed President Conrad that he will be leaving Bazzuto. The association will, therefore, receive a new representative from Bazzuto regarding the proposed development at the top of Varnum Street NE. TRAFFIC. President Conrad asked Mr. Lionel Gaines, representative of Mayor Bowser, and Ms. Marita Riddick, representative of Councilmember McDuffie, how best to engage with DDOT regarding traffic concerns. They identified Tijon Jones and Colleen Willger are the Ward 5 planners. Ms. Riddick emphasized the importance of logging concerns into the Mayor’s Call Center, 311, before calling Councilmember McDuffie’s office or any representative. Councilmember McDuffie and his staff may more effectively assist neighbors if there exists a record of a neighbor’s complaint. They will also look into complaints of tickets closed without resolution. Ms. Riddick and Mr. Gains made various announcements and passed out related leaflets for neighbors. The meeting began at 6:33 p.m. with the Pledge of Allegiance. President David Conrad introduced the evening’s main speakers, Laura Popielski, Community Foodworks and Robert Oliver, Lamond-Riggs Library Friends. Ms. Popielski emphasized three main points. Community Foodworks manages and overseas many of the local farmer markets, to include the Monroe Street Market, which will continue until early December. Community Foodworks markets Community Supported Agriculture whereby individuals may purchase through subscription a mix of produce from local farmers. Through this program, varied prices levels are offered. Lastly, Community Foodworks sponsors Food Pop-Ups to allow organizations to purchase wholesale from new and growing businesses. Additionally. Ms. Popielski emphasized various incentive programs for the purchase of food at farmer’s markets to include senior checks and food stamps. For more information, please see the organization’s website, http://www.community-foodworks.org. Mr. Robert Oliver, President of the newly revitalized Lamond-Riggs Library Friends, spoke about the planned renovation of the library. This renovation will be a complete tear-down and reconstruction on the current site. Mr. Oliver and members of the Friends want to ensure the immediate community has input into the developmental plans for the new library. Toward that end, Mr. Oliver is visiting the affected neighborhood associations. The Friends established an on-survey survey to solicit input. The survey will be closed after September 20, 2017, so Mr. Oliver will forward the URL for immediate posting on the MPCA’s website. A paper copy of the survey was also handed out to members, though on-line submission is much preferred. 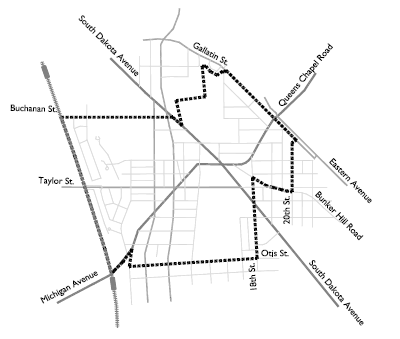 President Conrad reviewed the many planned developments along 12th Street and Varnum Streets NE. These include the EYA development of the Saint Josephs Seminary grounds; the Bozzuto development of the Providence Hospital property at the top of Varnum Street; the planned expansion of Munda Verde Public Charter School into the vacant building, 4401 8th Street NE; and the transition of Providence Hospital into a mixed use “health village,” recently reported in the Washington Business Journal. No details are yet available about the future of the hospital, but Providence Hospital is closing obstetrics and behavioral health, the two most expensive departments. In the background of these developments is the re-writing of the city’s comprehensive plan. Mr. Steve Lowe gave an update on Mundo Verde. The school board approved the school’s plans to establish a second campus at the site; however, as David noted, the planned renovation to accommodate a larger student body would still have to meet zoning requirements. Mr. Lowe also noted that the school’s parents were not in favor of opening a second campus because they believed the school did not have the resources for such growth. Their opposition only delayed the date of the school’s expansion plans. Ms. Beulah Sutherland read the treasurer’s report into the minutes. Bunker Hill Elementary will host a back-to-school night on September 13, 6-7 p.m.
Mr. Lorenzo Wheatley noted a difficulty in the lights at the intersection of Michigan/13th Street/Taylor St. When turning left from Michigan onto 13th Street, there is no room or space to turn on a green light, after the green arrow light ends. He recommended a red arrow light to preclude left hand turns on green only. Mr. Bucksell noted that the Brookland Livability Study had included this intersection and recommended improvements, to include HAWK signals for pedestrians, though no action has been taken. Mr. Lionel Gaines from the Mayor’s office and Mr. Cyril Crocker, filling in for Marita Riddick, from Councilmember McDuffie’s office, made various announcements. The meeting ended at 8:25 p.m.